With Christmas just days away, I’ve been thinking a lot about the first Christmas and the magnitude of Jesus being born into our messy world; a stable, a manger, the smell, the cold, the vulnerable. There was no neat and tidy about the first Christmas. Just yesterday, we heard the news of the sudden passing of a friend, others we know faced an uncertain outcome after surgery for their child, my father-in-law has been moved into a dementia unit in a home and after 63 years of marriage, my in-laws are not in the same place, there’s a lot of adjustment for all of us as we watch the long goodbye of Alzheimers. The headlines are full of difficult news; yet I will choose to celebrate Christmas once more. Not because all is joyful, but because I don’t have to face the complexities of life all alone. Jesus enters my mess, and I can experience peace. I hope that’s an encouragement for whatever mess - or joy is in front of you today! This lovely image is from A Day for Daisies and its called A Sign I Give. I love the details in all the folds of the fabric and the beautiful open spaces to add colour. 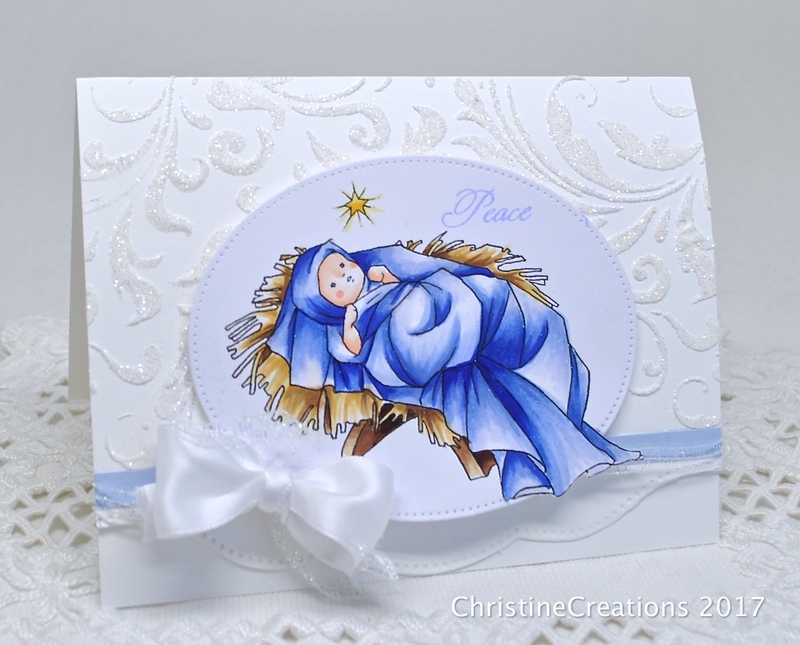 I placed the manger scene all on a white card base with a lot of sparkle. I used a stencil and embossing paste sprinkled (when wet) with glitter to get a very shimmery effect. So much so that you can see speckles of glitter on the image too. I added some scalloped border, some satin ribbon and some sparkly curly ribbon to finish it off. Your card is Beautiful, Christine, with all the glitter!!! But even more BEAUTIFUL is your words of encouragement! A very blessed Christmas to you and yours as you experience the REAL Christmas, Jesus, and all HE has for you!!! I love your comments that reveal the truth of our world and the Truth and Grace of our Lord. You've "said" your "heart" so well. And the image is so perfect with your words. 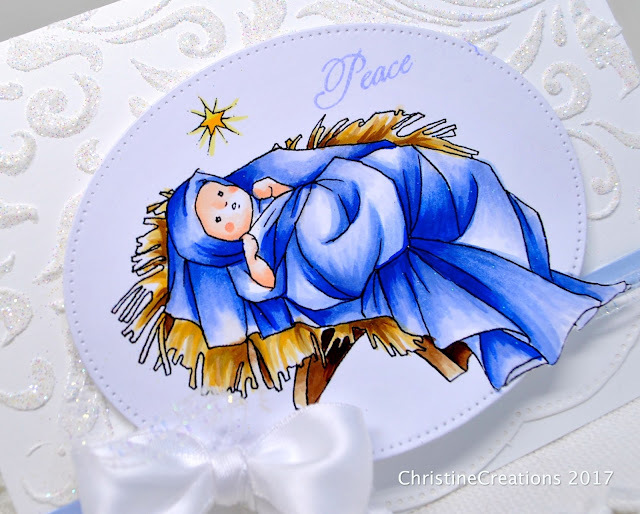 Your coloring is beautiful and your card is wonderful. Beautifully said Christine, throughout all the storms of life we need to keep our focus on Jesus! The card is so sweet and such lovely coloring! Beautifully said Christine. Jesus was born into a messy world and he is there to help us through all the mess of life and this world. God bless you and your family and may you have a Blessed Christmas. Your card is beautiful and represents the true meaning of Christmas. Beautiful card, beautiful words. I actually needed to hear this today. Thank you. What a beautiful message today, Christine, and a beautiful card to go along with it. You make me feel encouraged in this messy world.